For my final project, I’m in the process of designing a website based around author, Michael Ende. My intention is to analyze his current “official” website and websites for similar authors in an attempt to inspire my own work. Michael Ende was a German author of mostly children’s fantasy and was considered to be one of the most successful German authors of the post-war period. He received more than 40 literary awards and was also heavily involved in politics and political debate. 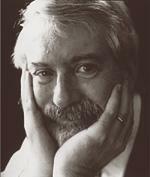 His most popular works were “The Neverending Story”, “Jim Button”, “Momo” and “The Night of Wishes”. Michael also did work in the arenas of poetry, short stories and even theater. 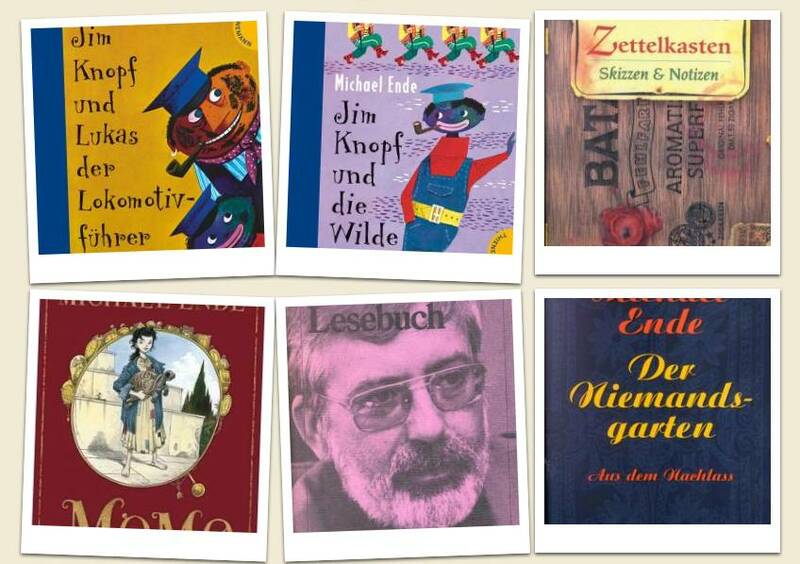 Michael Ende’s official site was originally only in German but in 2011, was re-translated to an English version as well. Both versions are identical aside from the language used. The page is an off-white color with the text appearing to be either hand-written or the product of an old-fashioned typewriter. The body gives the appearance of gradually slanting down onto a dark-gray fabric background image. The top of the body has a drop-shadow that gradually narrows until halfway down and disappears. 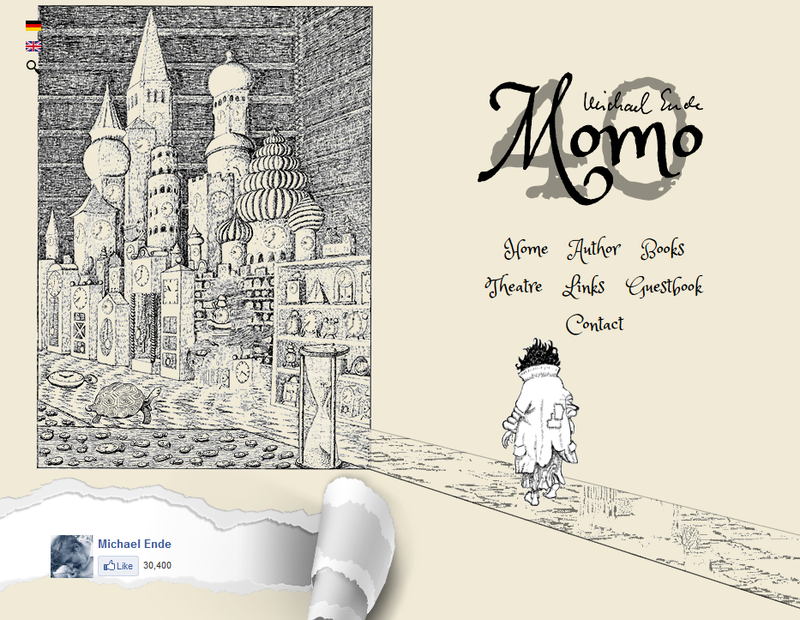 The logo for the website seems to incorporate the recent 40th anniversary of one of Michael Ende’s novels, “Momo”. The logo sits above a two-row navigation bar offering links to the Home Page, The Author, Books, Theatre, Links, Guestbook and Contacts. The main page has a hero image dedicated to the 40th anniversary of one of Michael Ende’s novel, “Momo” about a woman who lives in the ruins of an amphitheater and described as an “unkempt heroine”. The novel focuses on the concept of “time” and this concept is evident in the animated image on the main page. The heroine, Momo, walks onto the main page from off of the right side and strolls down a road under the title of the anniversary and the navigation into the actual image of what appears to be a city made of clocks and eventually walks into and disappears behind the far left of the image. The animation then cycles back to the beginning and repeats. Below this, a “piece of the page” appears to be torn up from the side, revealing a link to “like” Michael Ende’s Facebook page. Below that the “current news” stories are housed but do not appear to be updated all that regularly. The most recent story was dated Thursday, August 15, 2013. This story was about the apparent re-design of the website in honor of the 40th anniversary of “Momo” and a declaration of more news and upcoming events to follow, but nothing since. The next most recent story was from 2011. Below the current news stories is a numerical navigation list to browse all the previous articles. The footer of the page contains an illustration of several paint cans and brushes in the same illustrative style as the hero image. Each navigation section of the site has the same overall design except a change in the actual main image and the content. The image remains the same for each individual page within that particular navigation link. For example, the “Books” link on the nav bar provides a group of light-grey sub-groups (Fiction, Picture Book, Theatre, Poetry, Bebates & More and About Michael Ende). Each of these sub-groups have different content, but the main hero image from the “Books” link remains. In the sub-group “fiction” there are a tiled collection of images from his book covers. The puzzling part of this page is that the images appear to be in white squares that resemble the look of old “Polaroid” photographs. The image within the white borders are squares and often cut off part of the image and in some cases the actual title of the book (with no “hover” title to find out what link you are about to click). The logo, navigation and footer remains the same on each page. Normally, this sort of design would be ideal for consistency and ease of updating the content. However, in this case, the logo and image take up the majority of the browser when each page loads and you have to scroll down each time to get to any of the actual content and you have to scroll all the way back up to get to the navigation. The “Biography” page of the site is a perfect example of the difficulty. The main site is broken into an unordered list of titles, each title has its own page with only a few paragraphs of information and at the bottom of those pages, a link to go one page forward or one page back, requiring you to go back to the top of the page if you want to skip to a particular article. And each page requires you to scroll to the lower half of the page to begin reading. Another flaw I find with the design is the lack of color, which wouldn’t normally be a problem if the design was intentional (as this is), but there are a few smaller elements that do appear in color, such as the “flag links” on the upper right that allow you to switch languages between English and German, and the Facebook “like” link below the main image. Both of these are small and minor elements of the page, but as they are the only elements that appear in color they tend to draw the eye to them and off of the rest of the page. The navigation feels awkward and could definitely be improved, but the overall design feels like a children’s book with large type and illustrations–It is very representative of the author. 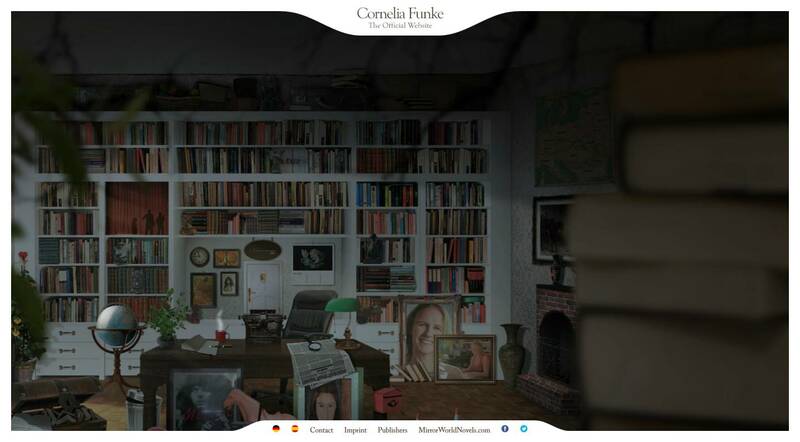 Cornelia Funke is another German writer of youth-themed fantasy and has written several books including The Ghosthunters series and the Inkheart trilogy. Her website is very fun and unique in its design. There is a general thin border around the browser that scales with the size of the browser, but only to a specific width before it begins to disappear. The entire main page is an image that is referred to as “The Writing House”. It appears to be a study that is viewed by looking through a bookshelf and the image moves around in conjunction with the mouse cursor. There are several interactive objects within the study, some of which are simply for fun, others as links to other pages within the site. Each link creates a “body” that goes down the center of the page while the background image of the room darkens behind it. 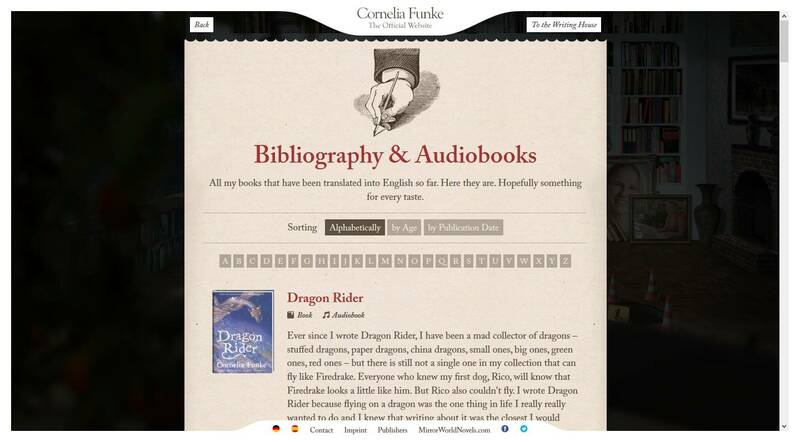 Unlike Ende’s site, the “books” link for Cornelia’s site uses thumbnails of her book covers so you can clearly identify the book and even listen to an excerpt from the audiobook (if available). Cornelia’s biography page is much shorter and easier to read. Whereas Ende’s biography was multiple pages of a few paragraphs each, Funke’s is a single page of only a few paragraphs. It’s not as thorough as Ende’s history, so it probably wouldn’t make for a good resource if attempting to study her life story. The individual pages in her website appear to be a pinkish textured paper with a single lightly printed header with her name in the border. She doesn’t shy away from the use of color and since she is still alive, it appears as if her site is updated much more regularly. There is a notebook on her desk and when you click it, it shows the title “Notes”. In here, there appears to be several small posts, including images that are dated, similar to “tweets” but are not identified as such. These appear to provide updates to things she is currently doing or working on and the most recent appears to be dated, October 29th, 2013. Although the “fun” of the main page appears to be of the most importance, its interface does make it difficult to find out what content is available unless you want to spend some time randomly clicking objects around the room to see what is provided where. If you are looking for something specific and quick, it can be frustrating to find. Daniel Handler is best known for his series of books, “A Series of Unfortunate Events”. Although he has written other books aimed at adults, such as “The Basic Eight”, “Watch Your Mouth”, and “Adverbs”, the majority of his success has come from writing about the adventures of the Baudelaire Orphans as the character of “Lemony Snicket”. Handler even pretends to be the representative of the fictional author when dealing with the general public. Any photos of “Lemony Snicket” presented always seem to be shot from behind, never showing his face. 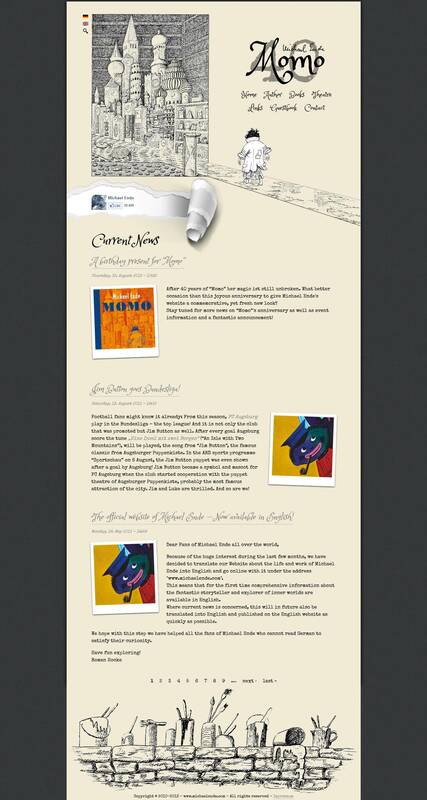 The fun of Handler’s “dual identity” is even used in his personal website at www.lemonysnicket.com. The website has a light brown fabric background image and the body of the page is confined to the center 1/3 of the browser. In theme with the “Series of Unfortunate Events” style of the page, the navigation bar at the header is a series of circles surrounded by thorny branches and the titles are all negative in context. 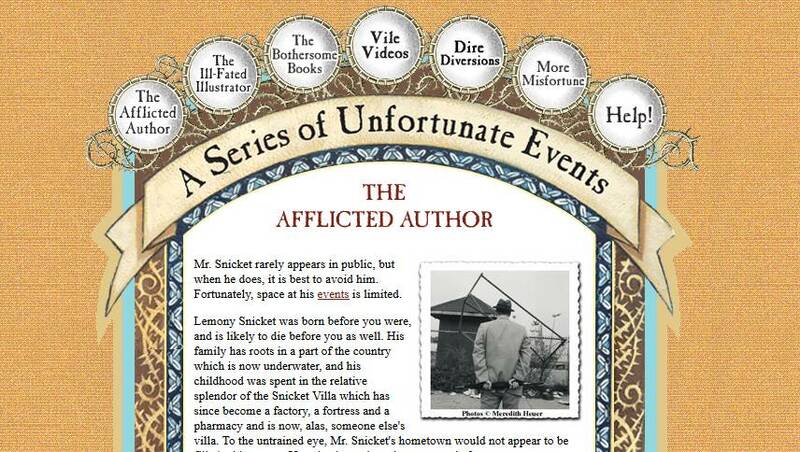 “The Afflicted Author”, “The Ill-Fated Illustrator”, “The Bothersome Books”, “Vile Videos”, “Dire Diversions”, “More Misfortune” and “Help!” are the titles of all the links available on the navigation bar and the border around the content is highly illustrative and changes only slightly in color and border from page to page. 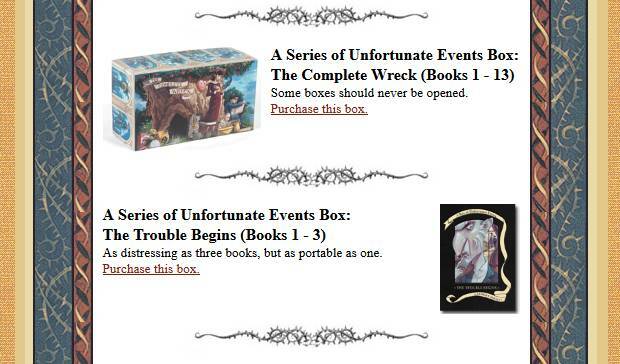 The character of the site also carries over into its commerce page where you can purchase books and box sets, all with descriptions written by Mr. Snicket in the same negative manner attempting to convince you to NOT purchase the books while selling you the books. In the “Vile Videos” section of the navigation, you can find a video of Lemony Snicket (with his face obscured, of course) which shows the atmosphere of the entire site. Out of the three pages I’ve researched, I would have to say this one is my favorite. It has the perfect balance of both information and fun and is simple to navigate. There is a lot of content if you are a fan of Lemony Snicket. The only real improvement that I would seek would be to provide more information on Daniel Handler and his work outside of the “Series of Unfortunate Events” books. Out of the three sites, this was the most fun to explore and read. 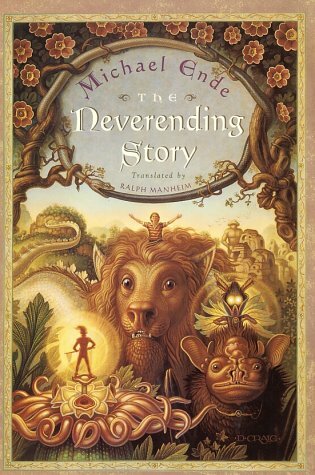 The publisher for Michael Ende’s “The Neverending Story” is Puffin Books, a subsidiary of Penguin Books, dedicated to younger crowds. The website is very, VERY basic in design. It is more specifically focused on content over decoration or establishing any kind of “feel”. 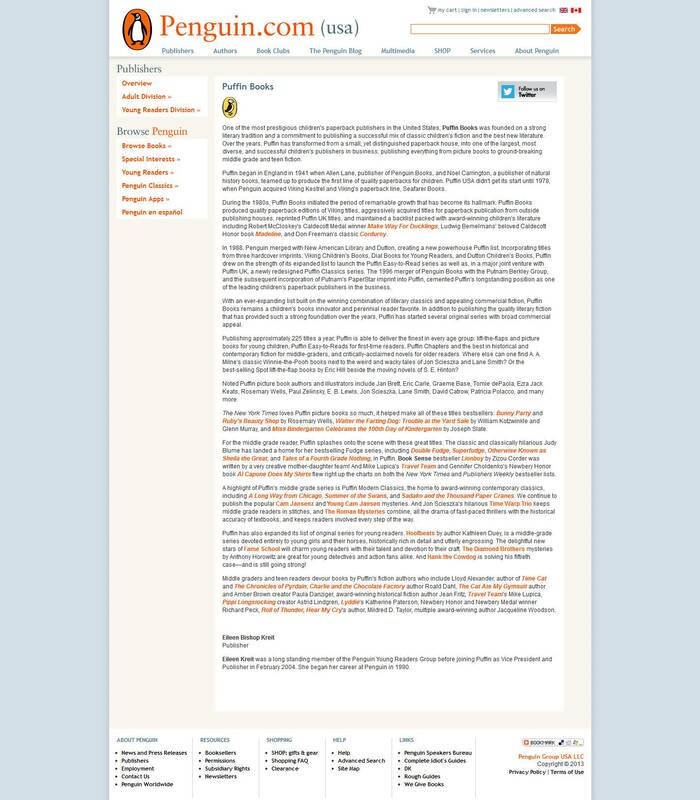 The body is much wider than that of any of the author sites and the navigation bar is across the top with a secondary navigation dedicated to the left side bar. The navigation is simple and easy to interact with. The content is very text-heavy and most imagery is in the form of small thumbnails. 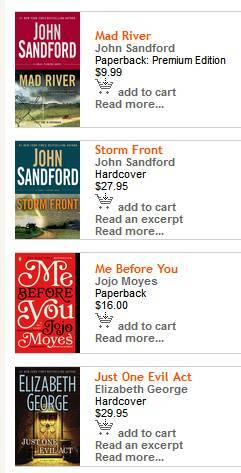 If the thumbnails are clicked, you are taken to that books own information page where you can get whatever information you may need on that title. The content is the primary concern of the site and providing information. The design is very basic without a lot of creativity or personality to it. Once you leave the site, you won’t remember much about it or even have much desire to return and explore. My current hope for the design of my site is to bring a feel of the magical and fantastical. I want to give it the feel of a child’s imagination as it will mostly be representative of “The Neverending Story” in which that is the primary theme of the story. I don’t want it to be illustratively heavy, but to include elements that work with the content to create an interplay between the two. 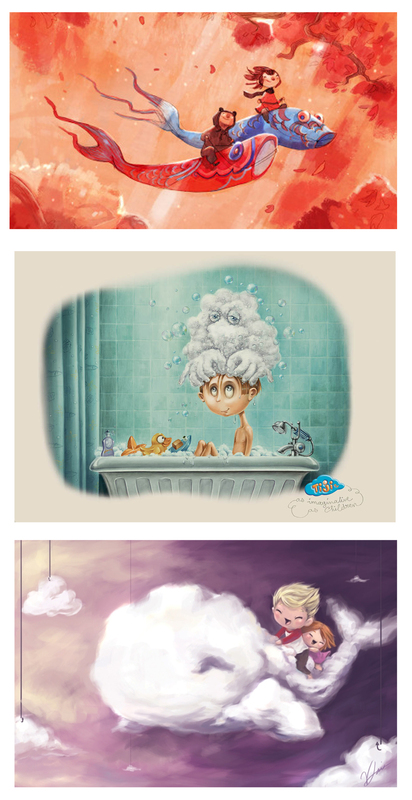 Illustrations that present the content, rather than becoming the content. I see softer and more muted colors to be used along with textures that may imply a dream-like quality. Any kind of character representation would be more obscurde and less specific. Like viewing them from behind. 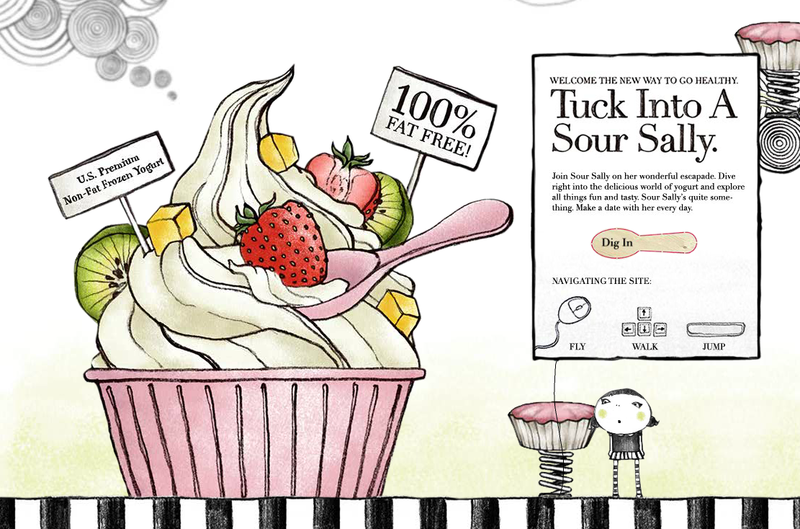 A website that I found was for a frozen yogurt company called “Sour Sally” at www.hellosoursally.com. The design is based around an interactive word and a small illustrated girl named Sally. The imagery is fantastical and dreamlike and not so overly complex that it draws away from any actual content. The website is very alluring and makes you want to explore it. I want to make the reader the character for my site that is either exploring the site, or observing the character who is, similar to the plot of The Neverending Story. I’m hoping to create a logo and navigation that will follow to each page, almost as if a character itself. And keep the fantastical elements lower on the hierarchy than the content. 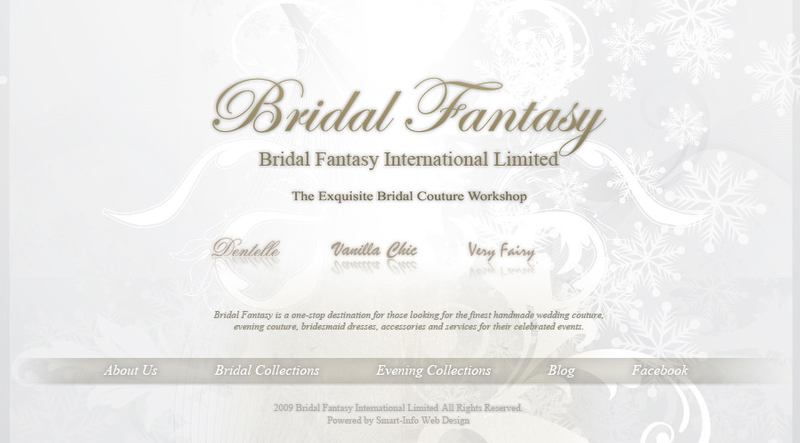 Similar to this “Bridal Fantasy” website. This entry was posted in Uncategorized by jaavik. Bookmark the permalink.